Sculpting in VR is nothing new. Actually, very little in VR is new, instead its what happens when things get lighter, faster, cheaper. Back in the 90’s we could create sculptures and move walls around in VR but it was very cumbersome, lacked the high feedback fidelity required to really make sculpting in VR productive over traditional 3D editing tools. 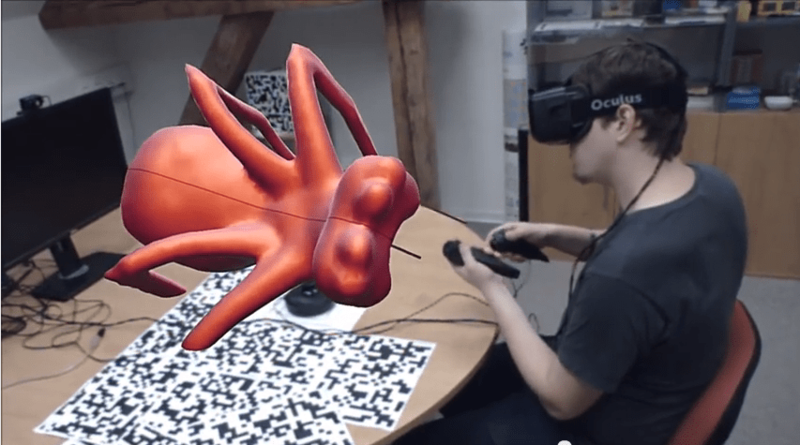 Although we are not quite at that point yet, but after seeing this video of someone using the Hydra 6DOF inputs and the Oculus Rift, its getting closer. Speed and accuracy, especially with the 6DOF inputs is making interaction more fluid. Its like seeing animations at 15 fps vr 45. Sure its feels like something is moving at 15 fps, but at 45 and 60, its a whole new level of realism. Its the same as we see in this video; the whole HCI chain from moving your hand, to changing the model to seeing that changed updated in the HMD is more realistic, thus reducing fatigue and allowing the user to become more adept and thus produce better results. VR and AR is finally coming of age.